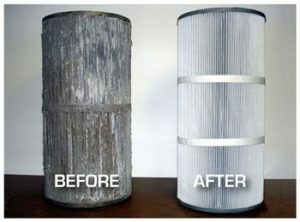 Manufacturers recommend filters be taken apart and cleaned every 6 months. Remove & Clean: The grids or fingers of a DE filter need to be removed and cleaned every six months. A thorough cleaning with a garden hose will remove excess DE cake that has bridged between DE grids, and help remove accumulated wastes, oils and minerals. Grid Maintenance: As you give your DE grid assembly an annual cleaning, inspect it closely for any tears in the grid fabric. Grids can be replaced individually as needed. There are 7 large grids and 1 small grid in a typical vertical grid assembly as shown above. Also inspect for cracks in the manifold on top, or problems with the air bleeder assembly, which can be a fabric “sock”, or a small metal screen. Ensure that your entire grid assembly is held together tightly by the through bolts and that the standpipe o-ring is intact. A cartridge pool filter has the simplest of design, water is pumped into the filter tank and forced to pass through pleats of spun polyester. The dirt is trapped in the many layers of woven fiber, and cleaned manually by removing the cartridges and cleaning with a garden hose. A sand filter uses specially graded sand to trap dirt and bacteria as water is pumped through the sand bed. Backwashing, or reversing the flow through the filter, flushes the sand bed clean. Simple to use, low maintenance pool filter. Don’t Over-Backwash: Backwashing as a regular maintenance task, instead of waiting until the pressure gauge is 8-10 lbs higher, can reduce overall filtration efficiency. Replace your Filter Sand: If you have a very small sand filter, you may need to change the filter sand every season. For appropriately sized sand filters, 5-7 years is about how long it takes to round-off the sharp edges of the sand grains, resulting in reduced dirt-trapping ability.